To hear Mark Hollis tell it, the seismic creative shifts made by Talk Talk—the band he formed with bassist Paul Webb, drummer Lee Harris and erstwhile keyboardist Simon Brenner in 1981—between each of its five studio albums didn’t feel as big as they sound. No matter if it was the difference between a new-wave pop juggernaut like “It’s My Life” and an open-ended pseudo-classical instrumental passage, a chintzy sine-wave synth or faintly warbling woodwinds, or two months of time spent in the studio versus two years. When discussing the radical stylistic shift between the band’s last commercially successful release, 1986’s The Colour of Spring, and 1988’s open-ended studio collage Spirit of Eden, Hollis insisted that “mentally, there was no big jump at all… the biggest difference was the amount of time.” The Colour of Spring is an exemplary and visionary art-pop album, but it’s a transitional effort (Talk Talk’s equivalent of Bowie’s Station to Station, perhaps). It’s hard to see how even the person who made both records could not view them as two essentially different forms of musical expression. Almost any critical writing about Spirit of Eden and Talk Talk’s final album, 1991’s muted and experimental opus Laughing Stock, praises those albums’ peerlessness—the way in which they establish both a mood and musical logic that few records have emulated before or since. With the exception of scorching guitar crescendos, Laughing Stock, in particular, shrugs off signifiers from previous rock music almost entirely. But Hollis never hesitated to cite his direct inspirations, even naming one-to-one reference points. The harmonica clusters on Eden’s “The Rainbow” mimic avant-jazz icon Rahsaan Roland Kirk, blowing two saxes at the same time. As for the crowning cut off at the end of Laughing Stock’s “Ascension Day,” “it’s nothing original,” Hollis remarked, citing Love’s Forever Changes. These comparisons come from an unusually candid interview included on a promotional cassette for Laughing Stock. 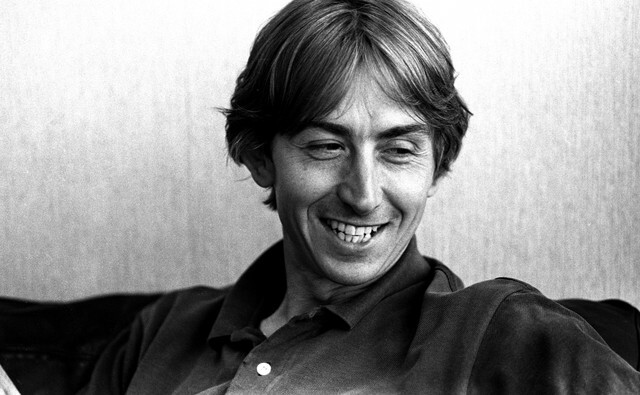 On the tape, Hollis talks about the genesis of Talk Talk’s finest and most unusual album, released on Polydor after the band was sued by their former label, EMI, for Spirit of Eden’s failure to be “commercially satisfactory.” (Perhaps the label thought reviewers and DJs would understand the new album better if Hollis walked them through it.) Speaking in his thick and melodious Cockney accent, Hollis’ commentary is full of unforced poeticism and incidental humor. Hollis once described himself as a “difficult geezer,” and his clear annoyance with the promotional obligations of the album cycle simmers beneath the conversation without undermining it. (Hollis once got through a Q magazine interview about Spirit of Eden with mostly “heavy-shouldered shrugs and staunchly monosyllabic pleas of ignorance.”) His description of his process is self-effacing, colloquial rather than high-theoretical. I can think of few more rewarding artist commentaries on a piece of their own music. On the tape, Hollis spends some time discussing the album’s opening fade-in, “Myrrhman,” a melancholic, blues-infused elegy that has without a doubt led countless new listeners to check if their speakers were working. It’s an especially unusual way to start a rock record: hardly there, structurally impossible to pin down, the quietest possible form of uncompromising experimentalism. In Hollis’ telling, “Myrrhman” is like a tune-up; there’s a theatrical, overture-like element to it. Hollis sounds like a ringmaster in the song’s final “Sergeant Pepper’s”-like entreaty: “Step right up, something’s happening here / Something’s happening here.” The rattling of Lee Harris’ stray drum set was wrought in the image of the scene Hollis imagined when listening to Elvin Jones’ shadow of a backbeat on Duke Ellington and John Coltrane’s 1962 recording of “In a Sentimental Mood.” “It sounds like the bloke setting his kit up…for the second track,” Hollis said. When capturing moments like these, Hollis and co-writer and producer Tim Friese-Greene avoided shaping acoustic sounds in post-production as much as possible. Like the great engineers at jazz labels such as Blue Note and ECM Records (the latter of which Laughing Stock could have conceivably been released on), Hollis believed in mic placement as tantamount to capturing the idealized sound of an instrument, and thus the correct mood. Later on his final solo album of 1998—a chamber-music variation on the Laughing Stock ethos—Hollis would use only two mics, capturing pristine, dynamic sounds he would leave almost entirely unmanipulated. Unlike so many rock musicians and producers of his decade, his approach was similar to the filmmaker who aims to make the viewer cease to notice their angles and dialectic, letting his techniques simply do the work of telling the story. Thinking about how fresh and unknowable Laughing Stock continues to sound almost three decades after its recording, there’s nothing more exciting and impossible to imagine than Hollis’ eureka moments when editing. How did he know when he’d slid those simmering, asymmetrical organ licks on “After the Flood” into position? Where did he hear the measure beginning? What possessed him to pluck out the long, elliptical guitar lick around which “Taphead” is based? Was he somehow able to tap his toe along to it? Even if it’s usually impossible to locate the downbeat on Laughing Stock, Hollis somehow knew exactly where to place his oddly catchy, totally unquantized little scraps of melody. By all accounts, this instinctive process was maddening as it was rewarding: Hollis was waiting for an endpoint that he wasn’t sure if he’d recognize when he saw it. After listening to the album innumerable times over the course of the 10 years since I discovered it, I still can’t imagine how he ever knew he was done. What was the purpose of so much obsessive labor, which seemed enough to drive Hollis away from public music-making as much as the whims of business side? What was the macro-level intention? Few albums that are this inherently experimental feel this personal and spiritual, and so little like an experiment for experiment’s sake. “It’s just about virtue, really, just about character, that’s all it is,” Hollis told Melody Maker, discussing the record’s lyrics. “I can’t think of any other way of being able to sing a lyric and actually sing it and feel it unless I believe in what I’m singing about.” The statement feels related to his process when choosing the perfect stray instrumental glyphs, and a path towards creation on which there was no way not to lose himself. Even if the process led him into creative oblivion, or away from making music entirely, nothing was more important than preserving that precarious sense of integrity and empathy. Hollis’ greatest hope for his music, he told his interviewer on the promotional tape, is that it would come to “exist outside of the time in which it’s written.” “If you start stylizing sounds, [they] will become rooted to an actual period,” he explained. Hollis refused to categorize Laughing Stock in terms of genre. Though he preferred to discuss jazz reference points than rock ones, he loathed nothing as much as the idea of jazz-rock, shuddering at the notion of “a rock band with a saxophone.” His own music arguably works more like 20th-century chamber music anyway. Laughing Stock’s particular brand of inimitability helped inspire a blanket term—post-rock—that once sounded as intriguing as it now seems overwrought. The shorthand felt like an extension of Laughing Stock’s inherent, utopian thesis: that, with patience and a bit of gentle hubris, any artist can find and invent their own looking glass through which to travel, pulling themselves out of context.